In 2005, when Asha from Koduman village received the keys to her newly constructed house, she couldn’t stop tears from rolling down her cheeks. The 400 sq-ft house was self-contained, with two rooms and a galvanised roof, completely different from the one she previously lived in—a plastic shed with a makeshift dupatta that loosely hung in place of a door. After her parents passed away, Asha lived with her grandmother and struggled hard to make ends meet. “I was moved to tears when I learnt about her financial condition. 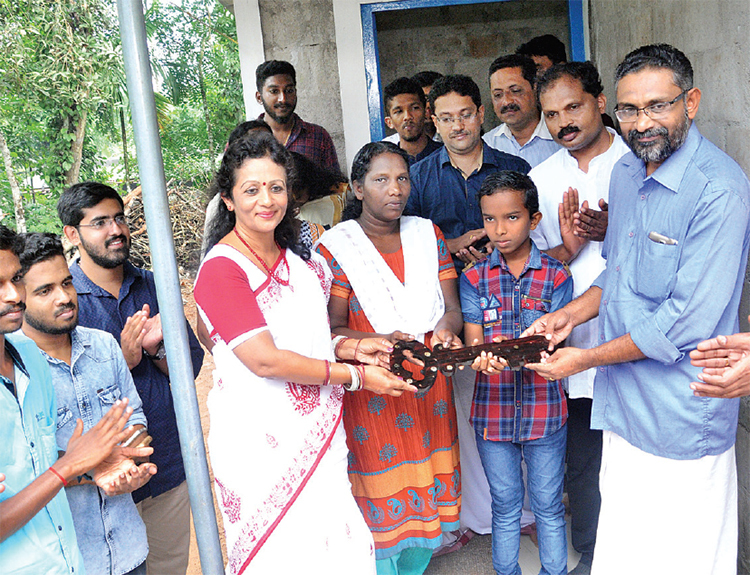 The house she lived in was unsafe; so I decided to help her by building a new house for her,” says 57 year-old Dr M S Sunil, a zoology professor at Catholicate College in Pathanamthitta, situated in Central Travancore region in Kerala. Later, in 1994, she joined as a zoology teacher at the Catholicate College in Pathanamthitta. Though her charity continued in small ways, she truly explored her philanthropic bent in 2005 after joining as an officer of National Service Scheme programme that focussed on community service. There, she came across many students who needed financial help and decided to make a difference to their lives. Her first beneficiary was Asha, an MSc student at Catholicate College, from Koduman village. Dr Sunil procured some land with the help of the village council. With an extensive and demanding collection drive, she managed to collect ₹ 60,000 and got a brand new house constructed for Asha. The rehabilitation completely turned the student’s world around. Today, many years hence, she’s employed as a teacher at Government Vocational Higher Secondary School in Kaipattoor, Kerala, and married to an Army personnel with a daughter studying at Kendriya Vidyalaya. The project also set the trend for more success stories to follow. Sreelatha, another beneficiary of Dr Sunil’s largesse, also lived under a makeshift plastic shed in the same area. A solo breadwinner in her family, she worked hard to support her paralysed husband, two daughters and a niece. But this time, Dr Sunil moved on from conducting a collection drive; she looked for a benefactor instead. “Within three days, she found a benefactor for our house. Even in those three days, she personally came over to our place to provide us food and financial aid. To date, she helps us with medicines, books and other basic needs,” says Sreelatha. With time, those in need of help started directly approaching Dr Sunil, who was actively involved with empowerment and development programmes. 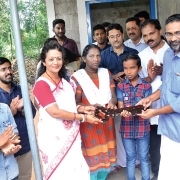 People from her village as well as strangers knocked on the doors of ‘Kripa’, her home in Azhoor, near Pathanamthitta town. But the doors would be open to only those who asked for help for other people. There were some she stumbled upon on her own or who approached her directly, but she made it a point to conduct extensive research to assess the family’s financial needs. With time, people began trusting Dr Sunil for her transparency and generously came forward to help. Among the first benefactors was Kokkathodu-based K P George, who is currently running for municipal elections in Fort Bend County, Texas. His example paved the way for more sponsors from India, as well as beyond borders. The impressive list includes Dr Philipose Mar Chrysostom, metropolitan emeritus of Malankara Mar Thoma Syrian Church; Dr K P Yohannan, founder and metropolitan bishop of Believers Eastern Church; and P J Kurien, educationist, social activist and former deputy chairman of the Rajya Sabha. As a policy, Dr Sunil began to adhere to single donors for one house. “I accept money from one patron for one house to maintain authenticity and transparency. Hence, during the handing-over ceremony, I announce the name of the patron, so people know the ones who showed kindness and compassion,” she explains. 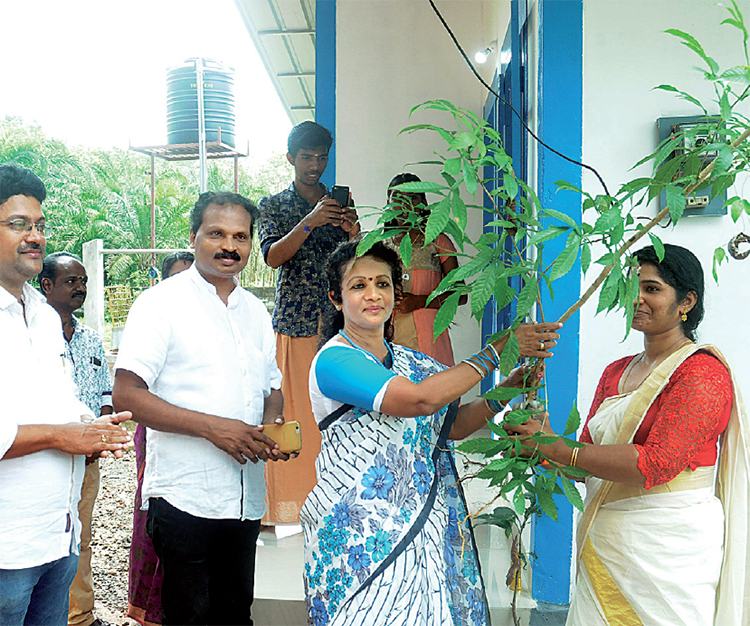 Whenever there was a shortage of funds, she never hesitated to put in her own money; at one time, she even roped in her husband P Thomas, who owns a supermarket in Pathanamthitta, to fund the construction. Over the years, Dr Sunil’s work of building homes has grown from strength to strength. And helping her in her selfless journey is K P Jayalal from Konni, who has been actively working with her since 2008. Jayalal is a man of few words but immense zeal to rehabilitate people. Under the umbrella of Dr M S Sunil Foundation, they have built 107 homes till date, the latest in Pandanad, which was drastically affected by the recent Kerala floods. Together, they have also rehabilitated 74 families in Pathanamthitta, one in Kollam district and two in Alleppey district. As part of her charity work, Dr Sunil has donated livestock to over 30 families to help them maintain a steady source of income, donated books and stationery items to over 1,000 students, provided spectacles for silvers, supplied hearing aids and donated over 278 wheelchairs to the differently abled, sometimes through sponsors or out of her own pocket. She also helps people pay their utility bills and provides grocery kits to over 50 families every month to improve their standard of living. That’s not all. Being the NSS district coordinator since 2014, Dr Sunil is responsible for organising blood donation drives and seminars on environmental protection. “We organise at least four blood donation drives every year and collect an average of 300 units of blood with each drive. My college students and I have donated blood many times and so have our families,” she shares. She was bestowed the ‘best blood donor motivator’ award by NSS for five consecutive years. She is also a part of the District Police Programme and actively works towards raising awareness against drug abuse and traffic violations. “I have known Dr Sunil for the past 10 years and she has really inspired the masses. 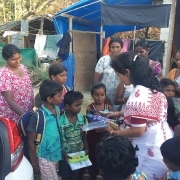 It is difficult to quantify the impact generated by her work but the large number of people showing up in her drives keeps everyone in high spirits,” asserts Leelamma A R, sub-inspector of Thannithodu police station, Pathanamthitta, who also helps Dr Sunil with logistics and supports her in these programmes. Dr Sunil also financed an operation for a women’s employment unit for manufacturing LED bulbs some time ago. Unfortunately, the project was shut down within three months owing to lack of financial assistance. “We made about 800 LED bulbs at that time and all of them are now being used in the houses we’ve built,” she reveals. During the Kerala floods this year, her foundation conducted relief work by providing clothes, food kits, garments and kitchen utensils. “Most areas were adversely affected in our region and many people had lost their homes,” she says. 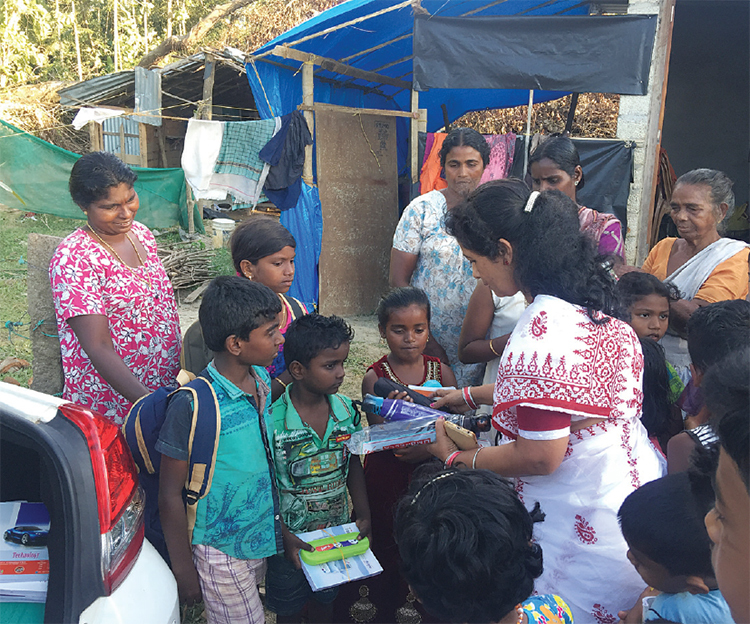 “Our volunteers coordinated with the district collector of Alappuzha district and helped as many as 75 families.” Not surprisingly, the next house being built under the foundation is for a flood-affected family.